C.S. Lewis, in his book on love, writes of loving someone so much you want to eat them up. “Love you? I am you!” Is one of the expressions he uses to convey that feeling. I know that feeling well. That is the feeling that makes me kiss the soles of my son’s feet, and that spot on my husband’s forehead, right between his eyebrows. It is the feeling that compells me to growl like a beast and pretend to gnaw up Thor’s neck, while he giggles and howls, and to blow fantastic raspberries on my B’s belly. It is the feeling that inspires bone cracking bear hugs, awesome tickle fights, and the best laughter on earth. The boys went off on a Man-Trip with Granddad this past weekend, leaving me all alone. I was delighted when they came home. I missed them! I think Thor might have missed me a little because he grabbed me, sniffed my hair and said, “I don’t know how you smell so good!” before running off again. And my wish for all you readers today, is that you love someone or something so much that you want to eat them/it*. While they were gone, I thought to catch up with my movie watching. You know, the shows they wouldn’t want to watch anyway (or that Thor isn’t old enough to screen.) You know what I ended up watching? The Godfather. I’ll be honest, I thought the first fifteen minutes were awful and boring. It didn’t get good until they shot Vito Corelone, and then I was interested. No, then I was hooked and I really enjoyed the rest. I also watched Bad Teacher on Saturday. As black comedies go, that one was pretty funny. I do wish people would stop trying to make Justin Timberlake The Actor happen, though. He is hilarious on SNL, but otherwise, he is strictly Disney style. Really. Watch that video. God bless him. He tries. But he succeeds at making great music. Anyway. Bad Teacher=Okay Movie. 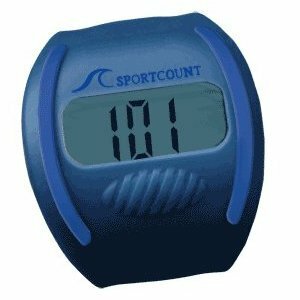 It’s a lap counter for swimmers–looks huge, doesn’t it? Nope. It fits on your finger like a secret decoder ring! It is so cool, y’all. I was swimming this morning, watching the timer while I stroked, and pretending I was a spy who had planted a device and was swimming away as the countdown ran. That lasted me two laps before Sweet Child of Mine came on my mp3 player and I had to concentrate on not playing air guitar underwater. I am that nerd. What do you think about when you work out? I have to entertain myself. *Don’t really eat anyone, okay? That’s not mentally healthy.